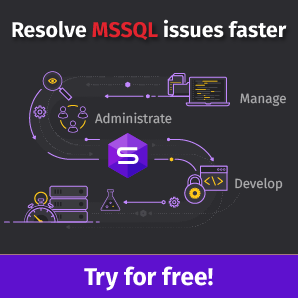 It is common knowledge in database circles that indexes improve query performance either by satisfying the required result set entirely (Covering Indexes) or acting as lookups which easily direct the Query Engine to the exact location of the required data set. However, as experienced DBAs know, one should not be too enthusiastic about creating indexes in OLTP environments without understanding the nature of the workload. 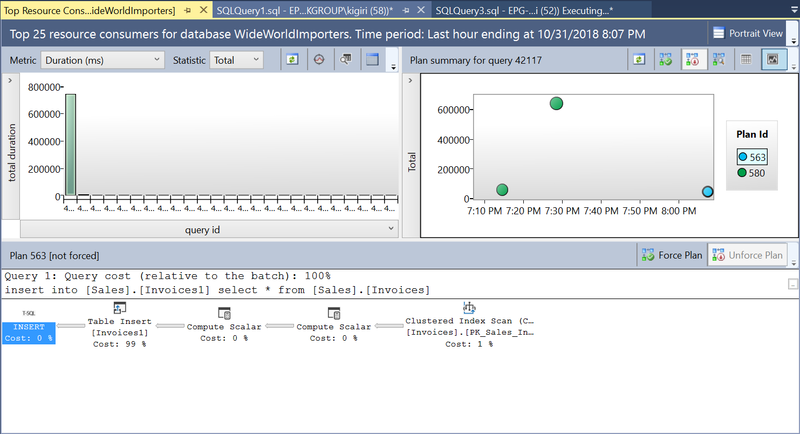 Using Query Store in SQL Server 2019 instance (Query Store was introduced in SQL Server 2016), it is quite easy to show the effect of an index on inserts. We start by restoring the WideWorldImporters Sample database and then creating a copy of the Sales. Invoices table using the script in Listing 1. 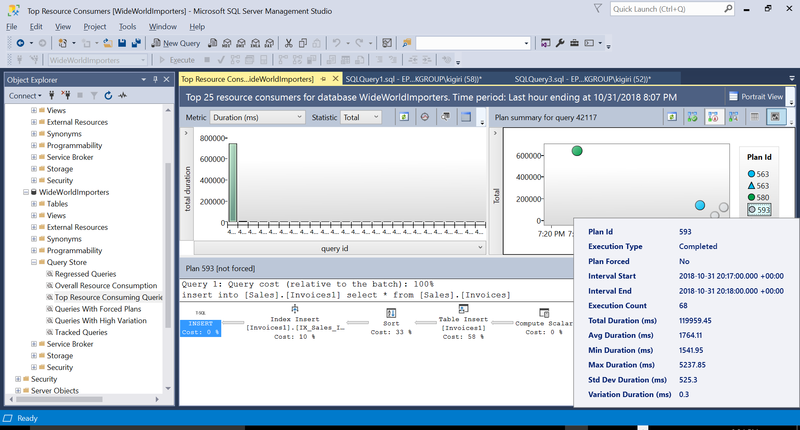 Note that the sample database has Query Store enabled in read-write mode already. Notice that there are no indexes at all in the table we’ve just created. All we have is the table structure. Once done, we perform inserts in the new table using the data from its parent as shown in Listing 2. 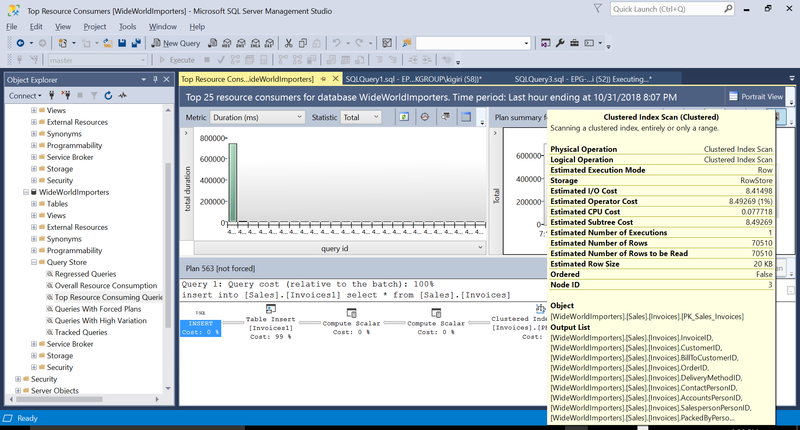 During this operation, Query Store captures the execution plan of the query. Figure 1 shows briefly what is happening under the hood. 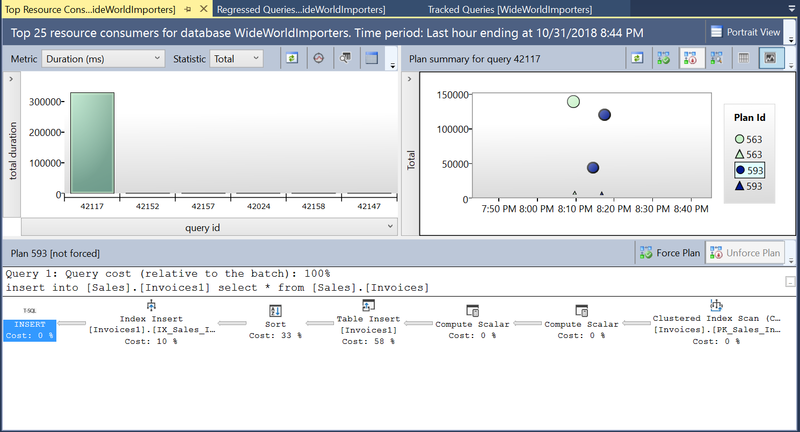 Reading from left to right, we see that SQL Server executes the inserts using Plan ID 563 – an Index Scan on the source table’s Primary Key to fetch the data and then a Table Insert on the destination table. (Reading from left to right). Observe that in this case, the bulk of the cost is on the Table Insert – 99% of the query cost. We then create an index on the destination table using the DDL in Listing 3. When we repeat the statement in Listing 2 after truncating the destination table, we see a slightly different execution plan (Plan ID 593 shown in Fig 4). We still see the Table Insert but it contributes only 58% to the cost of the query. The execution dynamics are skewed a little with the introduction of a sort and an Index Insert. 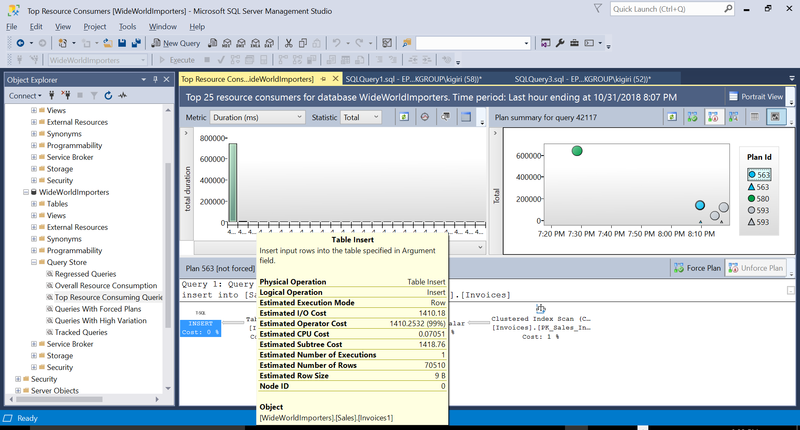 Essentially what is happening is that SQL Server must introduce corresponding rows on the index as new records are introduced in the table. We can examine the details of both plans and see how these new factors escalate the execution time of the statement. Plan 593 adds an additional 300ms or so to the Average Duration of the statement. Under heavy workload in a production environment, this difference could be significant. Turning STATISTICS IO on when executing the insert statement just once in both cases – with Index on destination table and without an index on Destination table – also shows that more working is done in terms of logical IO when inserting rows in a table with indexes. Table ‘Invoices1’. Scan count 0, logical reads 78372, physical reads 0, read-ahead reads 0, lob logical reads 0, lob physical reads 0, lob read-ahead reads 0. Table ‘Invoices’. Scan count 1, logical reads 11400, physical reads 0, read-ahead reads 0, lob logical reads 0, lob physical reads 0, lob read-ahead reads 0. Table ‘Invoices1’. Scan count 0, logical reads 81119, physical reads 0, read-ahead reads 0, lob logical reads 0, lob physical reads 0, lob read-ahead reads 0. Items 2, 3, and 5 are more related to performance impact with respect to reads, while items 1 and 4 are related to performance impact with respect to writes. Listings 4 and 5 are two examples of these publicly available queries. We have shown, using Query Store, that additional workload with an index can introduce in the execution plan of a sample insert statement. In production, excessive and redundant indexes can have a negative impact on performance, particularly in databases meant for OLTP workloads. It is important to use available scripts and tools to examine indexes and determine whether they are actually helping or hurting performance.